By: Matt Hickman on June 5, 2012, 6:38 p.m. Considered by some to be the greatest dog lover to ever take the Oval Office (sorry, Coolidge), Lyndon B. Johnson was master to a variety of pooches during his six-year presidency including a white collie named Blanco, a beagle named Edgar (a gift from J. Edgar Hoover, natch) and a mutt named Yuki found by the 36th president’s daughter, Lucy Nuget, on Thanksgiving Day at a service station near the LBJ Ranch in Texas. However it was a pair of adorable, creatively named beagles, Him and Her, that were perhaps the most famous – or at least the most photographed – LBJ canines. 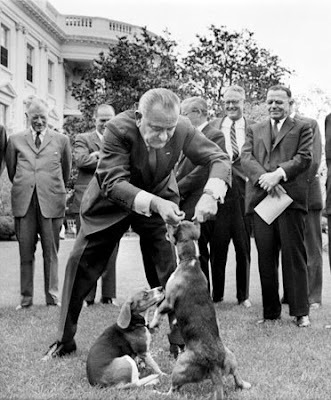 Born in 1963, the pooches were further thrust into the spotlight when LBJ was photographed lifting Him by the ears during a public speech. The photograph made front page news and, of course, animal lovers and activists freaked out, reprimanding the president for his actions while others, including retired president Harry S. Truman, came to his defense: “What the hell are the critics complaining about; that's how you handle hounds,” said Truman. Sadly, Him and Her both perished from rather unnatural causes while living at the White House: Her choked and died after swallowing a rock and Him was hit by a car while in hot pursuit of a squirrel on the White House lawn.